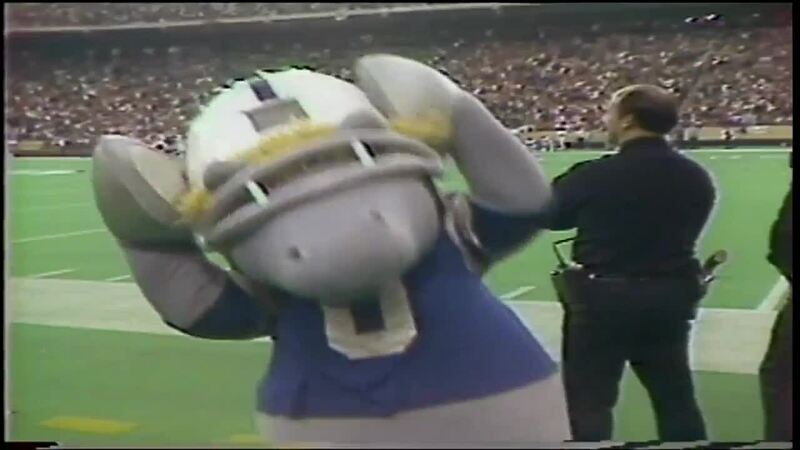 INDIANAPOLIS — Most Hoosiers are familiar with the Indianapolis Colts’ energetic and playful mascot known as Blue. But long before Blue, the Colts had a different mascot by a different name; Huddles. Huddles the horse had interesting proportions, to say the least. Huddles stood at five feet tall and was quite rotund. The gray-colored mascot wore a blue team jersey with the number zero. Topping it all off, Huddles had an over-sized white helmet with the familiar Colts’ horseshoes on both sides. Peaking out beneath the mask was a main of yellow, yarn-like hair, the kind you might find on a Cabbage Patch Kid doll (as seen in the video above). The person inside the suite was a mystery to most fans. Former RTV6 reporter, Marilyn Mitzel, spoke with the woman inside the costume to find out how she landed the gig. Barbara Spurlin, then 43, was an assistant manager at the Hartford Insurance Company as well as a firefighter for Wayne Township. In 1984, Spurlin and her husband were searching for groups to participate in the Indiana Volunteer Firefighters Convention parade. The pair called the Indianapolis Colts and were told the team had a costume, but nobody to wear it. Spurlin’s husband quickly volunteered; however, at 6 feet 4 inches tall, he would not fit. A costume and contract arrived, and Spurlin soon found herself on the sidelines. Her son, Kevin, served as her spotter ensuring she wasn’t run over by camera crews or football players. She told Channel 6 that she was paid a good piece of change for her work, but she wasn’t in it for the money. “I just like being part of the activity, being down there, being part of the team," Spurlin said. "You can have a good time with life and being the Colts’ mascot is fun, and I just don’t think you’re ever too old to try something new." Barbara Spurlin died at the age of 77 on July 10, 2018, in Danville.